Dedicated to the legacy of boxing legend Muhammad Ali, this limited edition watch from TAG Heuer carries the spirit of performance into its design. Inspired by the original 1957 Heuer Ring-Master model, the internal colours of the dial help you track boxing rounds. The red accent tracks 15 professional boxing rounds in 3 minute segments, while the white accent tracks amateur boxing rounds which are measured in 2 minutes. Both colour accents include 1 minute breaks which you can track by using the secondary crown at the 10 o'clock mark to rotate the internal bezel. The dial features Muhammad Ali's signature and an engraving of him is included on the caseback. Secured with a comfortable blue strap, keep track of the crucial last seconds of your favourite boxing matches with this precise Swiss-made timepiece from the makers of avant-garde technology. 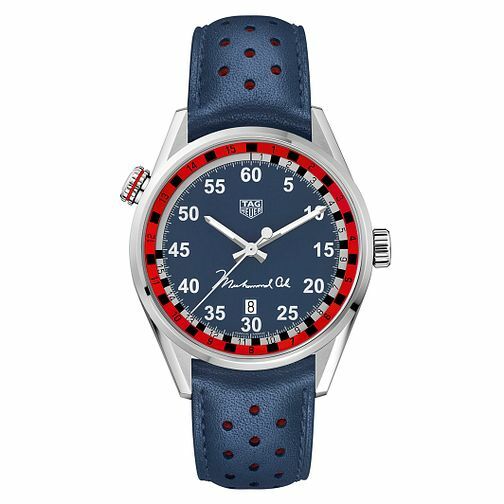 TAG Heuer Carrera Limited Edition Ali Blue Strap Watch is rated 4.0 out of 5 by 2. Rated 3 out of 5 by Anonymous from review The strap is not very comfortable to wear. It is too hard. Rated 5 out of 5 by Anonymous from ali watch the watch is excellent quality and a fitting tribute to the greatest good for a collector gives you something different for a boxing fan when you see the dial you will know what it means .